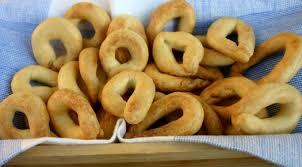 Taralli are toroidal Italian snack foods, common all over the southern half of the Italian Peninsula. 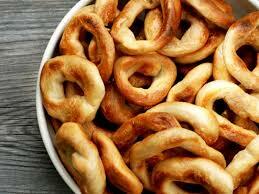 A cracker similar in texture to a breadstick, a pretzel, or a sushka, taralli can be sweet or savory. 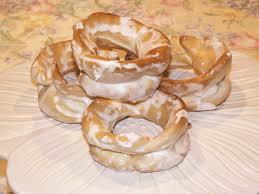 Sweet taralli are sometimes glazed with sugar. 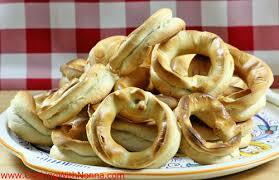 Savory taralli may be flavored with onion, garlic, sesame seeds, poppy seeds, fennel, pepper, chili or just salt. Sweet and plain taralli are often dunked in wine. 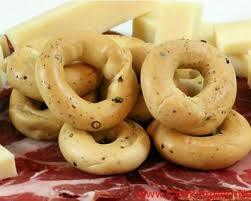 Taralli are classically formed into rings or ovals about 10 to 12.5 cm (3.9 to 4.9 in) in circumference. 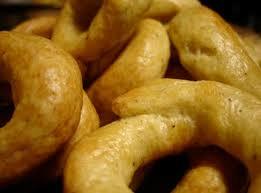 Smaller taralli, called tarallini, with a circumference of 3.8 to 7.8 cm (1.5 to 3.1 in), are sold commercially. Similar to bagels, they are briefly boiled before being baked, which gives them a very interesting texture. Baked taralli can be kept in an airtight container for several months. A variation can be made by deep-frying a sweet version of the rings and serving them with a sweet dessert wine. 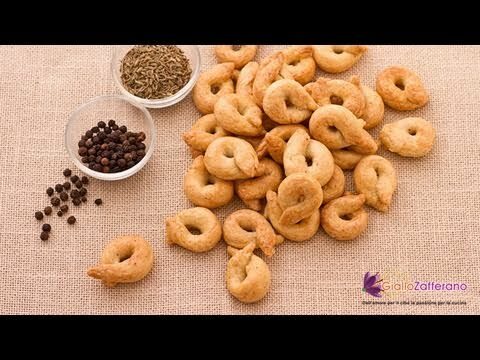 Fried taralli do not keep well and should be eaten quickly. Ingredients for one commercially sold tarallini brand: wheat flour, yeast, water, olive oil, fennel seed, black pepper, salt, anise flavor. “Gidrul” Italian Slang Word of the Day with Stevie B.